Our low carb granola cereal mix is easy to make and bake yourself with our easy to follow recipe, only 1 net carbs per 2/3 cup prepared serving! Tastes delicious AND gluten free! Break up the granola into a bowl, add some low carb milk or heavy cream for a scrumptious low carb cereal that both kids and adults will love! How about stirring some into your yogurt, low carb ice cream or sugar free puddings. Also makes a great topping for fruit cobblers or apple crisps. Super easy to make, you can prepare a batch ahead - it takes less than 5 minutes to add water, oil and vanilla to the mix, then bake, cool and store - the best tasting granola cereal you've ever had! 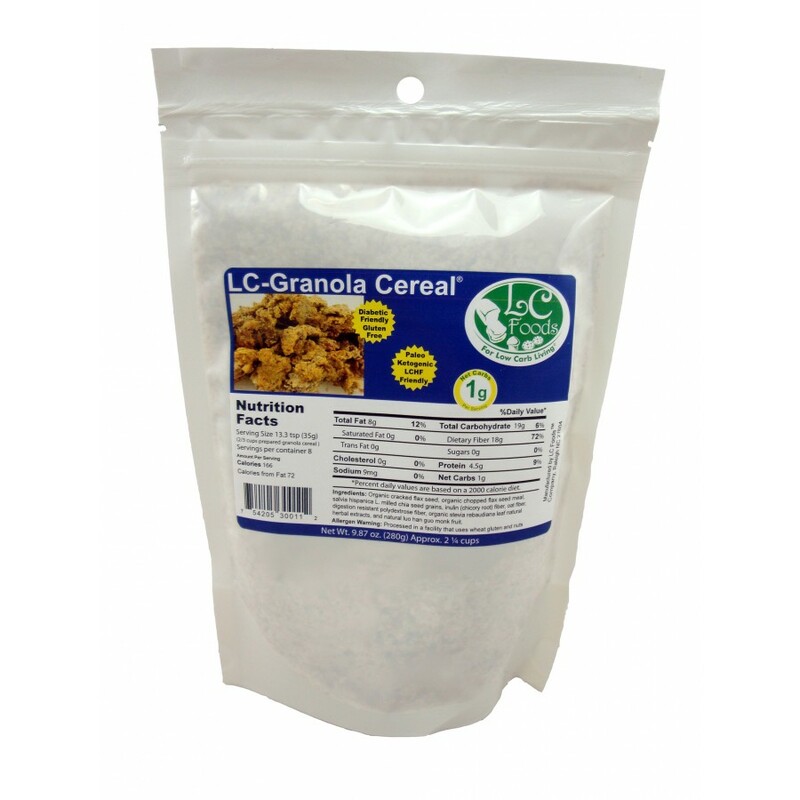 Enjoy this delicious and crunchy cereal while you maintain your healthy, low carb lifestyle! This mix makes over 5 cups of granola. 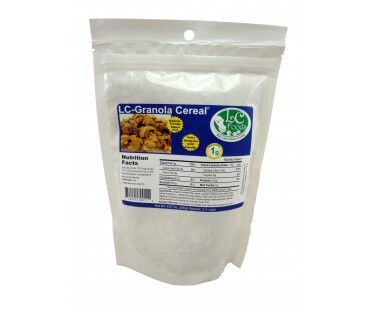 This low carb granola cereal has a healthy dose of dietary fiber. As with all LC Foods low carb products, there's no sugar added (of course!) and no preservatives! Organic cracked flax seed, organic chopped flax seed meal, salvia hispanica L. milled chia seed grains, inulin (chicory root) fiber, oat fiber, digestion resistant polydextrose fiber, organic stevia rebaudiana leaf natural herbal extracts, and natural luo han guo monk fruit. I ordered a sample to give it a try. I started Keto back in September and I'm still getting use to trying new things. I have to admit this was delicious. I prepared it according to the instructions without adding anything else and ate it with a little almond milk. I'm in the process of ordering more. Purchased a sample to be sure I would like it. It made up very easily and did add some cinnamon and a sprinkle of Stevia powder before baking. Came out fine, but cook time probably more appropriate for full size batch. Will order a full bag plus another sampler- as after eating the sampler [which I forgot to weigh before consumption] my crunch crave was satisfied and I was full! Want to also try the coconut/almond flavor next!